Ski aficionados, friends and family gathered at the Grand Hotel in Killington on Saturday, Nov. 1, to honor Killington’s founder Preston Leete Smith. Bo Adams, NESM Board chairman, praised Smith as a pioneer who contributed to the sport to the benefit of all skiers. He noted that under his leadership Killington developed such innovations as the ticket wicket, the long ski season with early openings and late closings, the development of GLM, and the assemblage of one of the best management teams in the industry — all of which led to the phenomenal growth of the Sherburne Corporation. He recounted Smith as being “hooked on skiing” by age 16 and finding great partners in (the late) Joseph and Mary Sargent, who was in attendance and recognized. Killington President Mike Solimano, who has been at the resort for 14 years, noted that he first learned about Smith through reading the book on the history of Killington and the employee newsletters where Smith shared observations with his staff. Solimano said that in 1985, Smith had written, “I believe skiing is a great elixir” and had explained how the efforts of staff would be appreciated by our visitors and put a smile on their faces. On a bright note, he announced the snowguns were on and that the resort would open on Monday (Nov. 3), a date in keeping with Smith’s legacy of a longer ski season. Referencing Tom Brokaw’s “the greatest generation,” Coniff said Smith was from the generation of the great pioneers in the ski industry. He praised Smith’s dedication to productivity, recalling a drive to get more productivity out of Killington’s lifts and cited Smith’s “knack for hiring good people” and ability to delegate. Killington was “on the cutting edge of a lot of ski industry technology… Pres Smith always stuck out in my mind for his vision to build a good ski resort,” he concluded. Parker Riehle, president of the Vermont Ski Areas Association, hailed Smith for making “après ski what it is today,” which drew appreciative laughter. On a more serious note, he expressed gratitude for what Smith did for the Vermont ski industry, noting it is the number one ski state in the East and number three in the country today. Killington’s first marketing director Phil Camp recalled being hired by Smith and told he “could do anything to get skiers here but to never go over budget.” Camp also said “it was all about the snow.” He recalled “the bucket and shovel brigade” that rode a chairlift to go up the mountain and get the snow out of the woods and onto the trails. It was illustrative of the dedication to provide a ski experience and a long season, Camp noted, thanking Smith for his career start at Killington. Praising Smith’s leadership and direction to his team, Wilcox told stories that illustrated Smith’s tenacity, observing that Smith always wanted to provide a ski experience, no matter the weather or conditions. Smith expressed being deep appreciative of the honor before sharing a few reflections. The NESM is a “main anchor to our way of life,” he added. “I was four years old,” he added, noting a lifelong love and appreciation of winter and snow, skiing and ice-skating. In true Smith fashion, he also shared his view of the industry, noting that one of his challenges as a ski area operator was to figure out how to “transfuse” that exhilaration found in mountains, snow, and skiing to all people. Explaining that, Smith admitted to a “pet peeve” — weather reporting and the so-called wind chill factor. We hear weather reports that “it is 38 degrees but the wind is going to create below freezing temperatures,” but that is simply “not true,” he stated, saying 38 is 38. He suggested a “novel idea for meteorologists when it’s going to be extremely cold. Rather than scare people, tell them to wear warm clothes, and we could stop creating wusses,” he said, eliciting a gale of laughter. 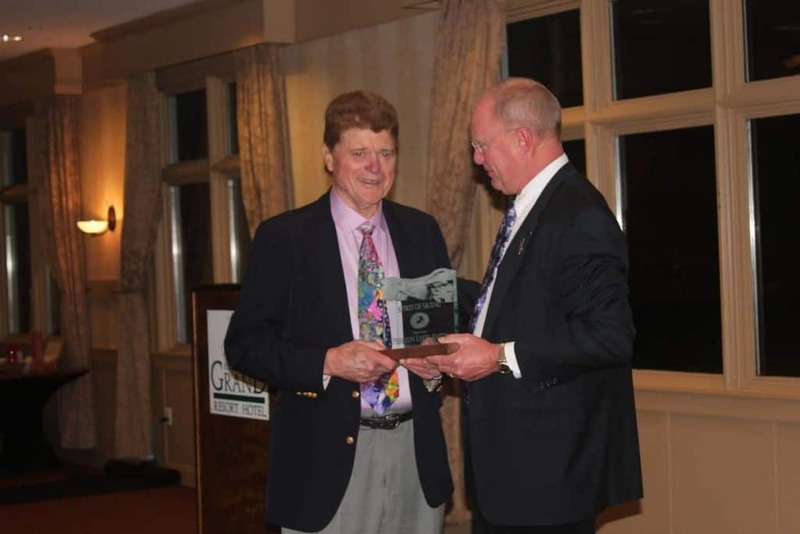 “It’s so important to preserve and pass that on and that is the work of the NESM which deserves our support,” he noted, as he thanked those who contribute to preserving skiing’s heritage. Smith concluded his remarks with one last admonition to “always wear ski clothes and avoid wind chill” and received a standing ovation.